A 10 year old boy received a new trachea grown from his own stem cells attached to a colagen scaffold. Doctors at the Great Ormond Street Hospital (GOSH) along with colleagues at the University College London, the Royal Free Hospital, and Careggi University Hospital in Florence have successfully transplanted a trachea into a 10 year old boy using his own stem cells. A donor trachea was taken, stripped of its cells into a collagen-like scaffold, and then infused with the boy’s stem cells. The trachea was surgically placed into the boy and allowed to develop in place. Because his own cells were used, there was little to no risk of rejection. This was the first time a child had received such a stem cell augmented transplant and the first time that a complete trachea had been used. This also marks only the second time that an organ has been transplanted into a person while stem cells were still forming the new body part. Previous attempts required the donor organ to be infused with stem cells and incubated for weeks before transplantation. This surgery is an amazing step forward for regenerative medicine and organ transplants, and could be a sign of a new direction in these kinds of surgeries. We reported earlier about the first person to ever receive a stem cell grown windpipe. Claudia Castillo was around 30 when her stem cells were used to grow a new bronchea on a donated trachea scaffold in 2008. That windpipe was incubated in a lab for weeks before she was operated upon. In 2009, Dr. Macchiarini (leader of the team responsible for the earlier procedure) operated on a 53 year old Italian woman, replacing a portion of her trachea with a scaffold covered in her stem cells. As with the recent 10 year old boy, this operation did not require weeks of incubation. In fact, the stem cells were applied just hours before the scaffold was placed inside the patient. In just two years time, then, Dr. Macchiarini (and his colleagues in the EU and UK) has gone from producing the first stem cell organ transplant, to streamlining that procedure so that the organ is mostly reformed while still in the body. That’s simply incredible. Following this trend forward several iterations, and it may be possible to completely renew an organ, or replace it, simply through the correct application of stem cells. Compared to the newest non-stem cell surgical options, this procedure was considerably faster and less expensive. The unnamed 10 year old boy had Long Segment Tracheal Stenosis, a condition which narrows the trachea and makes the patient feel as if they are breathing through a straw. It is a potentially fatal condition. Typical treatments (which are still relatively new) involve a conventional transplant. The boy had received such a treatment but a metal stent used in that procedure damaged his aorta several years later. Rather than face the uncertainties of another transplant, with the risk of rejection, GOSH doctors requested Dr. Macchiarini’s help in transplanting a stem cell covered scaffold. Letting the trachea develop in the patient may eventually make this process cost just tens of thousands of pounds rather than hundreds of thousands. The procedure can be seen in a simulation developed by Dr. Macchiarini. The video can be found on the UCL News site by clicking the photo below. There is no sound. To further the development of the stem cells on the trachea scaffold, Dr. Macchiarini used various cytokine drugs (shown as injections in the video). These drugs help signal to the stem cells where and how to develop. While not directly stated in the press releases or news segments about this procedure, I suspect that such drug augmentation may become a more integral part of stem cell therapies in the future. As multipotent cells are directed to replace a wide variety of different organs and tissues, proteins and other chemicals may be necessary to speed stem cell specialization and keep it focused on the type of cell that is desired. When Claudio Castillo received her stem cell scaffold windpipe the procedure was basically just a lab test. It had never been tried before and was likely years from being developed to a point of clinical use. Now, with two more patients having undergone a new (and improved) version of the transplant, we can cautiously pronounce this a developing trend in treatment. Oh, we’re still years from seeing transplants of this kind from becoming commonplace, but every successful case is a step in the right direction. Also, with every new patient there are more doctors that gain experience in the procedure. I think that we are very likely to see more of these transplants (at the rare, lab-based level) in the near future. Hopefully we’re all a little closer to being able to use stem cells and scaffolds to grow new organs when we need them. I’ve said it before, and I’ll say it again: medicine is cool. The doctors and surgeons responsible for this miraculous trasnplant. 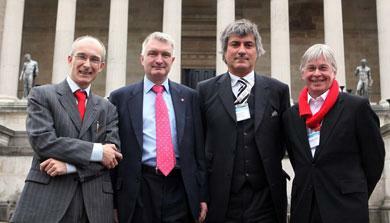 From left to right: Dr. Martin Birchall (UCL), Dr. Mark Lowdell (RFH), Dr. Paolo Macchiarini (Careggi), Dr. Martin Elliott (GOSH).